saturday eve found me back in elmira, raring to go for part two of the EndurRace event! 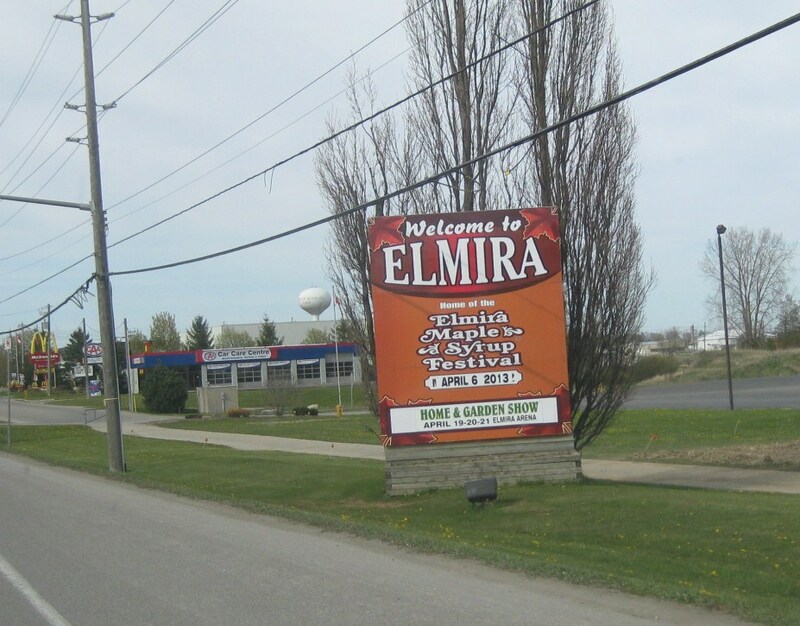 elmira is rightly very proud of its maple syrup festival! our distance this time was 8k – hallelujah for 3 more km’s to run than last week. 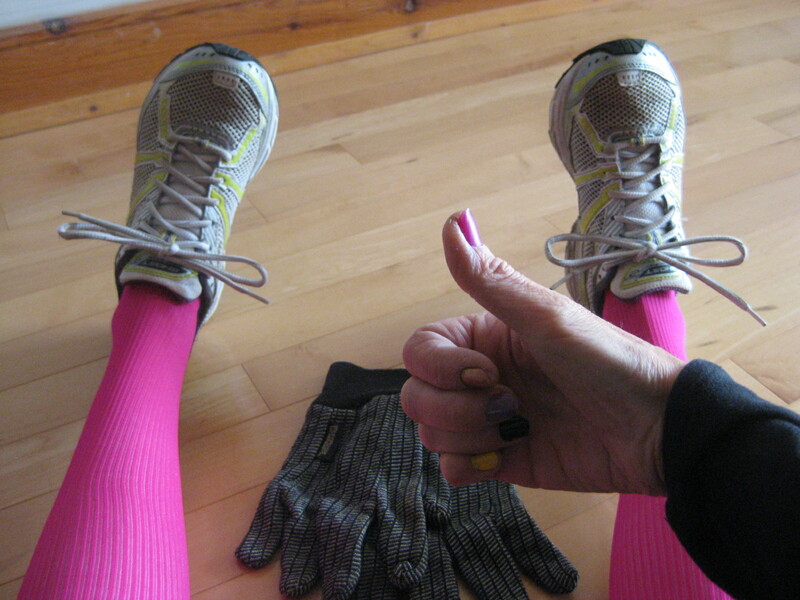 same compression socks, different shoes (brooks ghost 2's), redone racing nails, lucky gloves! the gel noosas were miffed that they had to stay home this week…but, i wanted to give my brooks ghosts a go! i’ve got ’em broken in just so. the course was almost the same as last week’s square, just a bit larger. i give the course designs an A+: they were picturesque, quiet, mostly flat. this week, i smelled bbq hamburgers along with the cow manure as we toured along (not a pleasing combination, trust me). [true confession: after last week’s results, i was not running solely for FUN, i was out for blood. i am only kinda joking]. my legs found their groove at the 4 k mark. at 5 k, i thought, “hey! last week i was done already!” and i was very glad i was not done already, this week. i really felt good at the 7 k mark. the field for the 8k was much smaller than for last week’s 5 k – like, there were about 100 less participants. [the waterloo half and full marathons were yesterday morning, that may have taken away some potential 8k participants]. weirdly, from about 6 k on, i had no one within sight. it was a bit lonely! i finished feeling strong and with a big smile – the way it should be. funny enough, i felt like i was running slower than last week, but i had an average pace of 4:48 per km which is 3 seconds faster than last week…see, i told you i need more distance!! and, i won a draw prize this week! 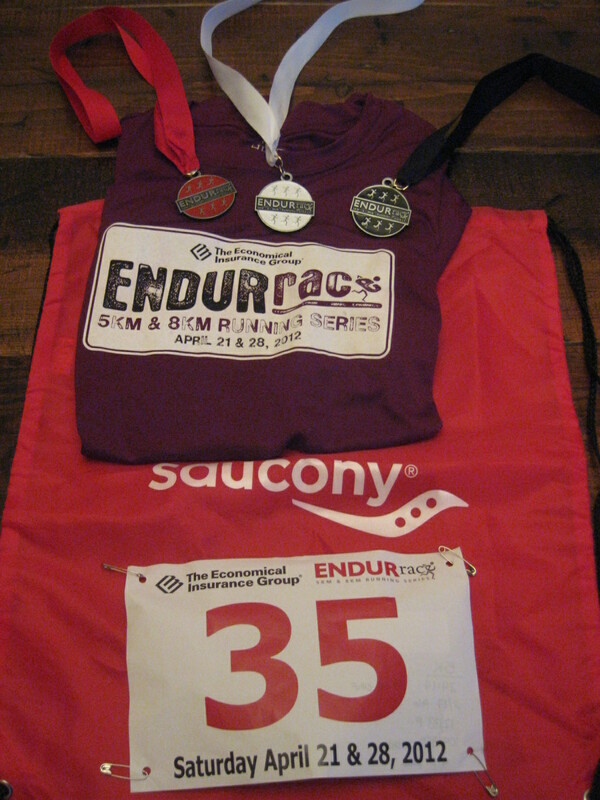 i chose a saucony drawstring bag – it was either that or a water bottle. soooo many people stuck around this week for the prizes and awards – i think the lure of the $250 cash final draw prize and the awards for the 5 + 8 k combined events kept people interested. numbers for 5 + 8 k combined events! ~ i felt loose and warmed up after a day of moving around. no tightness or stiffness that you sometimes have first thing in the morning. ~ i had time to gear up mentally, and excitement grew over the hours of the day so that by race time, i was psyched to get the show on the road! 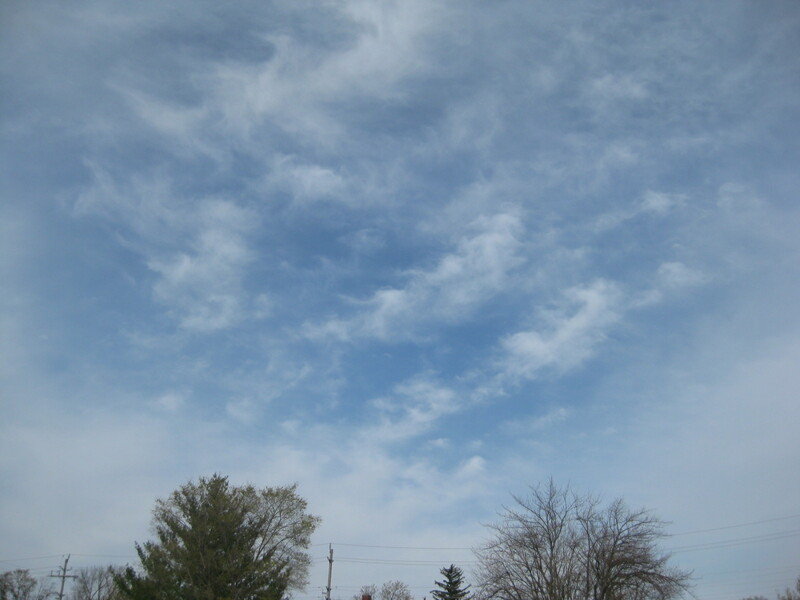 ~ the temps were warmer than first thing in the a.m.
~ w.a.i.t.i.n.g until early eve to run – my circadian rhythms like to get out in the early a.m. so i found it tough to wait til later in the day to get running. ~ since i worked at the store for five hours each saturday, my legs were not fresh like they are in the morning. so, now that BOTH parts of the EndurRace are complete and the work is done, i can wear the tshirt this week! [all participants in the combined 5 & 8k distances received the finisher’s medal on the black ribbon that you see in the photo, there]. the next race is all picked out. giddy-up! and just like that, today’s entry concludes our participation in the blogging from a-z challenge. i am so glad i joined in. i genuinely enjoyed the blogging-by-alphabet concept and felt creatively inspired. april zipped right past! the challenge organizers have invited us to write a final a-z reflections post on monday, may 7th, so i am going to wait for that date to share my conclusions and impressions. april: did it go fast or slow for you?? just like a marathon, the beginning and end dates sped by while the middle days progressed at a more languid pace. I love reading your running posts and am really glad you’ve started to do them. I know it was your goal before NOT to post about running, but I like hearing about the races around K-W, plus how a fellow 40-year old “young” lady is doing. I think the Endure race sounds amazing and am sorry I don’t live there to do it!!! However, race season has started in Geneva!!! Today they held the “genevoise” which is a race just for women in Geneva (5km). It precedes the Geneva marathon and half marathon that is tomorrow. Over a 1000 women participated today, me included!!!! Had a blast running by the jet d’eau (you will have to google that!!!) and didn’t do too shabby. The Geneva Tour du Canton starts at the end of May — a super competitive 4 stage race — we race every Wednesday for between 8 – 10 km and receive a ranking at the end if you complete each stage. Each year the race is held in a different part of the canton of Geneva. I have participated in this race 7 times now and can’t wait for this year. Unfortunately I have been plagued with plantars fascitis (sp??) this year which has really set back training, so I have had to set new goals for myself. The main goal is to run for fun above everything else! Anytime you would like to come and do a run in Switzerland/France let me know! julie, would that not be the most fun to do a longer race together some time, like you did with your sister, jane? i think we would have a blast! way to go on the “genevoise!” i am so glad you are running AND that you are doing the tour de canton again this year (you are in lance armstrong territory with your seven year streak, you realize!) – i LOVE the concept of the tour de canton, and i wish we had something like that here. good for you for modifying your goals. i know all too well how after we have been sidelined due to injury, it is just so gratifying to RUN! do enjoy every step!! and let me know how it goes! i am not sure how much running-blogging i will do…but i am glad you enjoy the blog posts. and i love how you referred to us as 40 years YOUNG! yes! age is just a state of mind!! congrats on an awesome race! has me itching to register for one here ASAP. 🙂 April FLEW by for me! it’s seriously crazy how quickly it went by. thanks, dorry! i can only imagine all the races available in nyc…i bet you could race every weekend! you had so much going on in april…i can imagine it went by in a blink for you. and more fun times await in may (moving?!) – i look forward to reading about your discoveries in nyc! Another awesome time for you! Funny, I asked you in my e-mail if you had any upcoming races – clearly I had not read this post yet. I did actually open this post earlier in the day, but then never seemed to get back to my computer! There, now I am up-to-date on your most recent race! thanks, tricia! 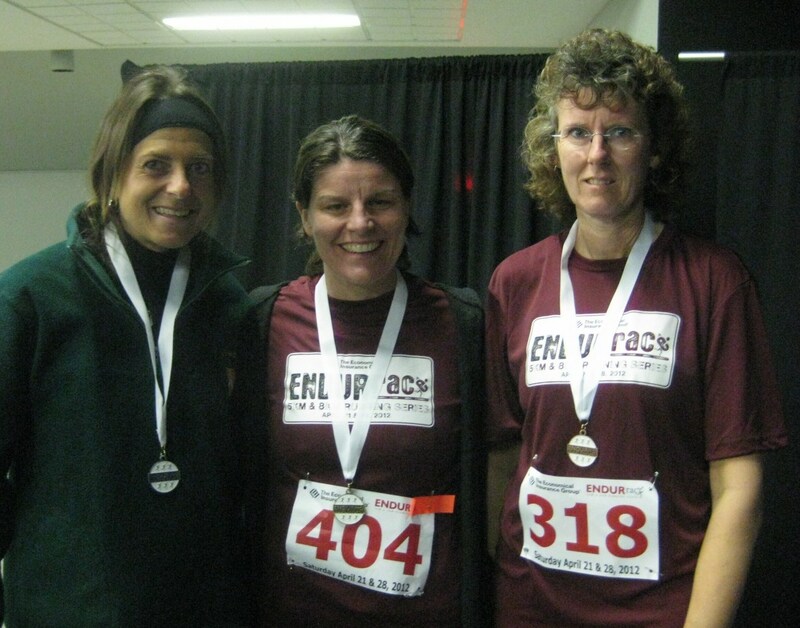 i highly recommend the races – well organized, great course…and the tshirt! 😀 i hope we can run the same local race some time – would be fun to meet up and hang out! Congratulations on your time (again). Wow…the A-Z challenge really challenged my ability to keep up with my blogs (you, Stephanie, and Fran were all participating…I knew it wouldn’t work this year for me…maybe next year!). I feel like April moved through pretty quickly. I’m definitely stunned that tomorrow is May. Looking forward to your recap post…and now I’ll have to get used to *not* seeing you every day! thanks, zo! 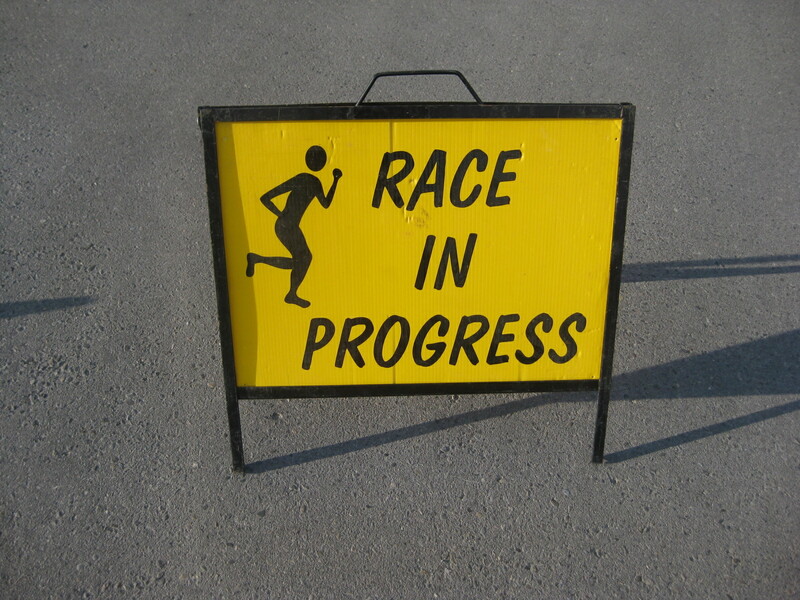 do you have any races planned? 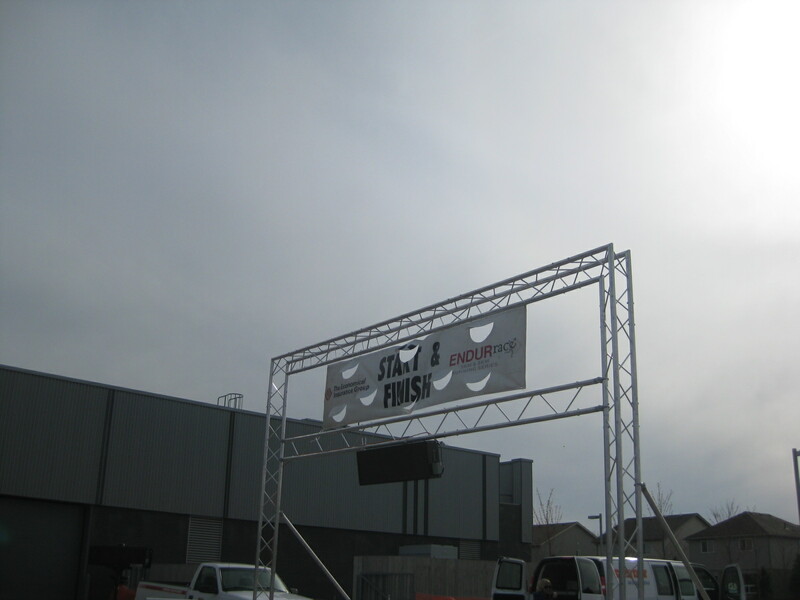 (did the 5k make you want to do another this year??). i hope you consider doing the challenge next year…and thanks for reading and commenting on all our blogs! it was fun to see what fran and stephanie chose for each letter every day, too, eh?! i’m glad you got to enjoy your weekend trip during the month of april! I’d love to do the “run with the doggies” race again…it’s coming up in a few weeks. I’ll be out of town then, so I have to miss it! Next year, I hope! Nice job! Of course, it took me a while to convert to miles, but I managed. lol. I love the compression socks! April was a blink for me—I don’t even remember most of it! thanks, lisa! yes – you had a busy month! it sounds like may/june is not really going to slow down for you! well, the faster we can get to hot july temps, the better for you and me! you know, i still think in terms of miles when it comes to longer distance training – who wants to run 42 km? 26 miles sounds much better! but 5 k rolls off the tongue better than 3 miles?!! April was extremely slow for me. I thought it would never be over. I spent some time in my basement Friday night while the tornado sirens blew for 20 minutes. Nothing touched down but better to stay safe. Good results on you races. Can’t wait for mine on 6/2. oh, i am sorry to hear about those scary weather conditions, johanna. i am glad to hear nothing touched down. i am excited for your june 2nd event, too!! you may be wishing for may to pass quickly?!! Oh! Congrats on your awesome finish. We saw you way ahead of us at the 5k mark and you were flying! thanks, ali!! i was feeling faster as the race went on – needed more km’s! sorry we did not connect after the race! i saw YOU running towards the finish line and you looked really strong! good job! ugh – i hear you on 4th – that is the most frustrating placing! it’s great that you have participated in so many races in only a year! yes – they gave out the medals AFTER the awards, right at the end. you can pick it up at runner’s choice, i bet, if you give them a call! We stuck around for a bit after…grabbed some fruit and waited for our results. Pretty happy with my race, but wished I had pushed myself just a little more. 4th is so dissappointing! I have to keep reminding myself that I’ve only been running a year! I did not get the finishers medal. How did I miss that? ooooo, thank you for commenting, dawn!! i had so much fun chatting with you on saturday! WAY TO GO on beating your goal time for the waterloo half – i saw your name in the results last night, and am so happy for you!!! enjoy your training now for the women’s half!!! i, too, hope may goes a bit slower…such a nice time of year!! Fast or slow for me?! Well, you RAN so you definitely are ahead of me, cutie!! We’re all doing the American Cancer Society Relay For Life on May 18th. We walk all night. I think I’ll pretend I’m doing a race. Walk as much as possible and see how far I can go! i am so excited for you, fran, and for your participation in the relay. boy, i cannot imagine going all through the night…i will be sooo sooo keen to read your report, afterwards!!! and i’ll be sending positive vibes on may 18th!!! very proud of your win! thanks, fran! i had fun!